My cousins from out of town were visiting me in NYC last week and they really wanted ramen as one of their meals while here. Since one of my cousins had already been to Ippudo, we opted to go to Totto Ramen instead. 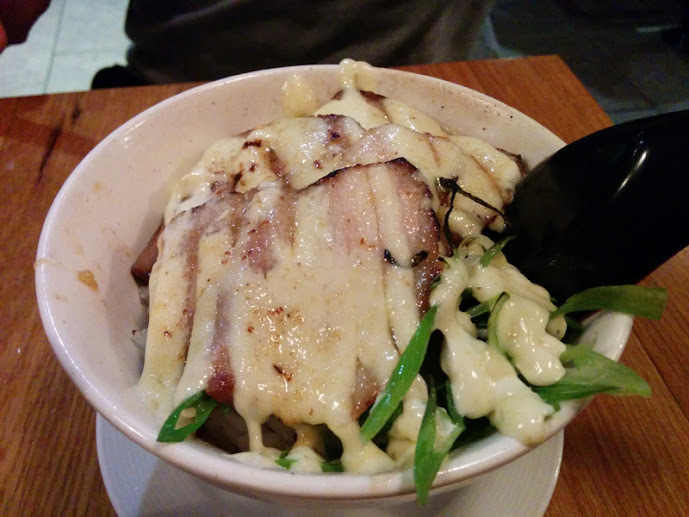 In addition to ramen, we also ordered char-siu over rice and a spicy tuna bowl! Click through the jump to see pictures and the review! My boyfriend got this to try since he's already had Totto's ramen several times. Essentially it's the same pork you get over the ramen, except it's covered in mayo (I'm assuming it's Kewpie, the Japanese mayo), garnished with green onions, seaweed, and served over a bed of rice. I personally think it had too much mayo since the pork is already rich from the natural fat on it, but my boyfriend enjoyed it nevertheless. I personally wouldn't order this myself or as a side dish, especially when Totto also offers a spicy tuna bowl (see below). 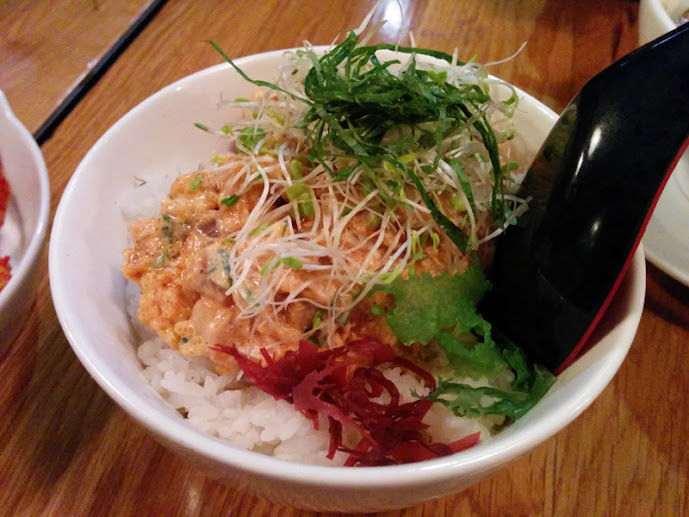 In addition to the char siu bowl, we also got the spicy tuna bowl. I love spicy tuna, and I had it before when I first dined at Totto. I shared this with my boyfriend. As you can see it is mixed with masago (fish eggs), topped with some seaweed, red radish, and sprouts. The rice was not seasoned sushi rice, but just plain rice that was slightly above room temperature. The tuna was delicious and had just the right mayo to tuna ratio. I have a pretty big appetite, and a bowl of ramen usually doesn't quite satisfy me. So, if you're like me, I would recommend getting the spicy tuna bowl on the side and perhaps share it with someone else in order to have a full belly! And finally the ramen! I got the paitan ramen which is Totto's original ramen bowl. I chose pork as my meat, but you can choose chicken or pork as your meat. The extras I added were the seasoned soft boiled egg (it's an add on, but it's a necessary in my opinion!). The ramen comes garnished with green onions, shredded pork, a little bit of onions, and some crispy seaweed. The broth is chicken based and therefore it's actually very light and refreshing to drink. Ippudo's broth is pork based and very rich. Totto's broth is not nearly as rich, but it's still just as flavorful and savory. 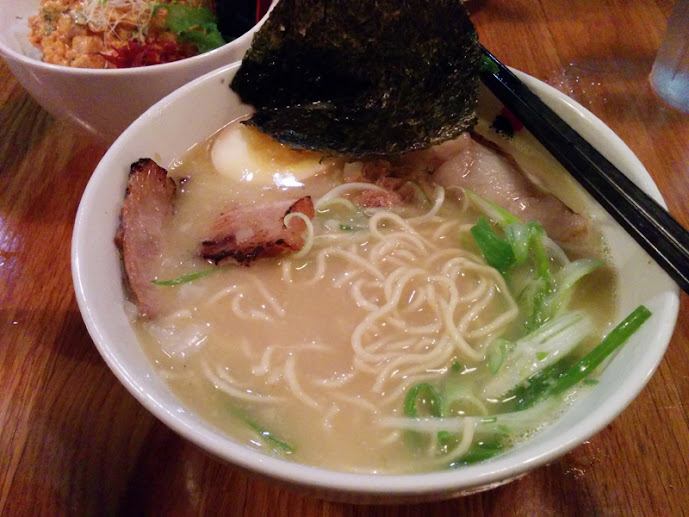 The noodles are slightly thicker than Ippudo's as well. Overall, the noodles are delicious and would of course be amazingly delicious on a cold city day. Not a lot of people seem to know this, but there are actually two Totto Ramen locations and they're literally within 5 minutes walking distance from one another (the newer location isn't even labeled on Google maps yet). The original location is a tiny underground establishment off 52nd between 8th and 9th, whereas the newer and bigger above ground location is off 51st street between 9th and 10th. For the original 52nd St. location, they do not take parties of larger than 4 so keep that in mind. The newer location off 51st has a large table that might accommodate a party of 6, but when we dined for dinner there that night there wasn't a party larger than 5. Also, like Ippudo, Totto also does not take reservations. My advice? Go to the newer location that is less known. We waited only 25 minutes compared to the hour to an hour and a half queue we would have suffered through in the other location!